Have you ever wondered what it’s like to have Christmas dinner in Europe? As you may already know, there’s going to be a difference between Christmas dinner where you’re from and Christmas dinner in Europe. But, the difference in culture makes it interesting. Also, different parts of Europe can have different Christmas dinner traditions which you may want to know about. What Christmas Dinner Traditions Do Europeans Have? The French love food, so it’s only natural that it is the highlight of Christmas Eve. They call it “Le Reveillon de Noël” or the Christmas Eve feast. Like most French meals, the Christmas Eve dinner is multi-coursed and can last for hours. The dishes served during the Christmas Eve feast will differ from region to region, because the dishes will be based on local ingredients and flavors. The Polish practice preparing Christmas Eve dinners too. But, before you can dig in, the entire family or group has to wait until the first star in the night sky is seen. After that you can enjoy the spread which typically includes carp or some other fish. There will also be a kind of wafer called “Oplatek”. It will be shared by the family or anyone at the table as it symbolizes forgiveness. Norwegians usually prepare traditional food like roasted pork ribs and dried mutton ribs during Christmas Eve. People from Norway have a few special Christmas dinner traditions that are similar to that of the UK. Children leave out porridge for Jul Nisse, a creature who guards farm animals and plays tricks on children if they don’t leave porridge out. Children in the UK on the other hand, leave out mince pie. Some also practice the tradition of hiding their brooms to stop witches and evil spirits from stealing them and riding the night sky on Christmas Eve. Slovakians also believe in preparing traditional dishes as well as practicing Christmas dinner traditions on Christmas Eve. What’s interesting is that if a family prepares carp, the fish has to swim in the family’s tub for one or two days. Here’s another interesting tradition: a father has to throw a sticky pudding called loska unto the ceiling; if it sticks, it’s a sign that the next year is going to be good. Family can then start eating. 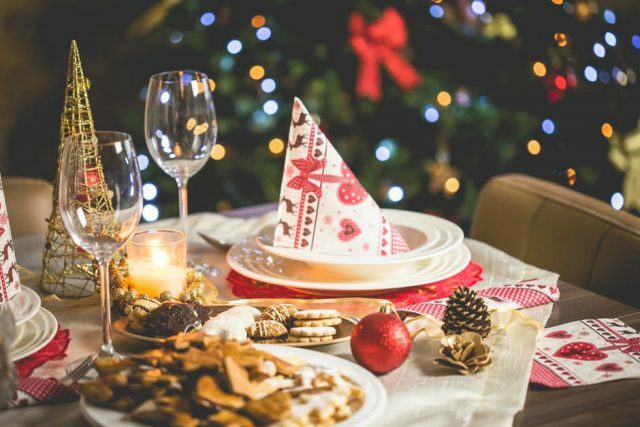 Did you find these European Christmas dinner traditions interesting? We hope you did. Remember that they can be conversations starters with European women you meet online. For more dating tips, do visit our blog for other posts. And don’t forget to visit AnastasiaDate as there are a lot of Eastern European women for you to meet there.